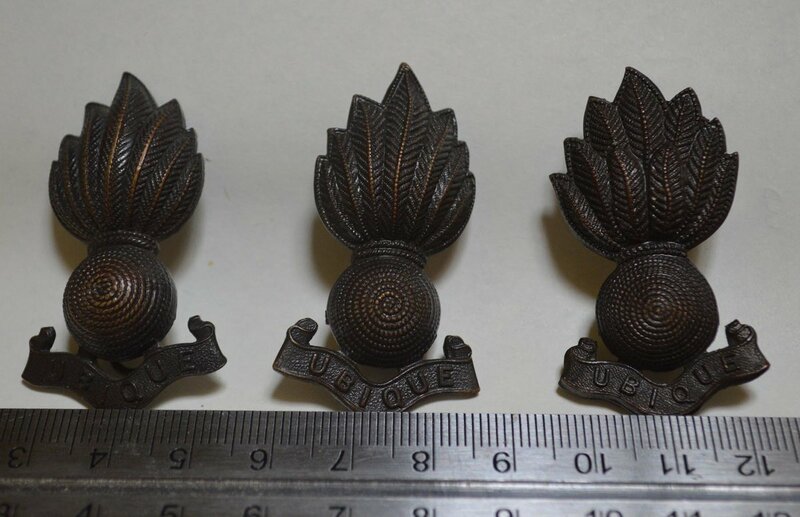 I'm assuming these are collar badges, but are they Royal Artillery or Royal engineers, and how do you tell the difference? They are all Officers service dress collar badges in bronze. May be a dumb question but what are the OR one made of please???? Hello Peter, not a dumb question at all. OR's were made of gilding metal, normally known as just 'brass'. Also, the RA & RE OR's didn't wear collar badges during WW1. Before the war, both RE & RA wore the brass universal grenade as a collar badge, this grenade was used by fusilier regiments also. Collar badges the same as, but smaller than the patterns above were introduced in the 1920's. The RE were always less ‘dressy’ than the RA and did not adopt a grenade as insignia until after the RA had used it for many years. At first the RE were not especially fussed about the number of flames and used both, 7 and 8 flame versions for their officers collar badge only, before settling for their own 9-flame version. At first RE other ranks had no grenade badge at all, but after 1881 RE SNCOs were ordered to wear the grenade above their rank stripes as an equivalent insignia to the RA gun badge, in both woven cloth and metal according to the order of dress. There was still no RE collar badge for other ranks and it was not until 1922 that RE ORs started to wear a gilding metal, small version of their officers’ collar badge with the UBIQUE scroll. When looking at black and white photos of RE and RA in the late Victorian period it is often only possible to tell which is which by the presence or absence of the grenade collar badge. I stand corrected on the RE pre war collars. Thank you FROGSMILE for the the info. I’m glad to contribute Chris and thank you for your courteous reply. The little brass and later gilding metal ‘universal grenade’ whose image you posted is an interesting little badge. First ordered for the collar of RA ORs in 1881, in 1905 it was decreed for Fusilier shoulder straps along with shoulder titles, as well as for the Grenadier Guards equivalent. By WW1’s end it had been used also as a metal alternative to cloth badges for infantry bombers and trench mortar batteries, in addition to the RE arm badge already mentioned. Further use was adopted by Commonwealth forces. Some Fusilier regiments, such as the Lancashire Fusiliers and Royal Welsh Fusiliers also used it as their full dress collar badge. It finally disappeared from the modern equivalent of the Priced Vocabulary of Clothing and Necessaries in 2006, when the latter regiment was merged with the Royal Regiment of Wales. An unbroken line of usage of 125 years! I wonder if that is a record for a single piece of Insignia. Lovely bit of history about a badge you don't really take much notice of, thank you. I've about 6 different versions of it, just slight differences. Going slightly off WW1 but didn't the FWF have it in anodised? 125 years I'd say is a record! Yes Chris, both LF and RWF wore anodised universal grenades after WW2. Drummers and bandsmen of the latter wore 4 apiece, 2 on collar and 1 on each shoulder strap. As you say, an item of insignia not much noticed and yet with a great backstory.